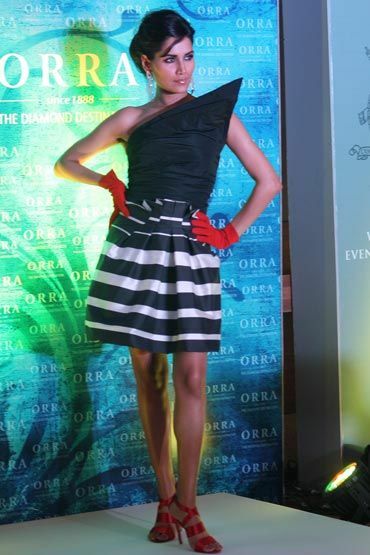 Diamond giant ORRA unveiled a dazzling diamond bustier worth 1 million euros, the first of its kind, in Mumbai on March 25. Also on display was a range of other sparkling jewels and designer ensembles by designer Anamika Khanna -- models dazzled on the runway as part of the event, intended to promote Belgo-Indian trade. Take a look. Model Anjali Lavanya had the honour of modelling the bustier, which is has been entirely created by hand and is studded with Belgian diamonds. Intended as a Western concept that draws on traditional Indian motifs, the stunning jewelled piece was set off to perfection by a royal gold lehenga. And to ensure that it did turn out to be just perfect, a team of designers and craftsmen worked on it for almost six months. Khanna's designs perfectly complimented the gems on display -- seen here is Amrit Maghera in a red drape, set off by a pair of diamond danglers. Not all of the garments, however, were ethnic -- take this quirky but cute little number modelled by Tapur Chatterjee, for instance. Tapur was followed by her twin sister Tupur in a ravishing red carpet special, topped off with plenty of ice -- necklace, earrings and an eye-catching wrist cuff. Stunning velour makes its presence felt by way of this bridal outfit, complimented by a thick choker and earrings in the style of tassels. Moni Dutta poses demurely in a sheer peach and yellow sari, a breathtaking emerald drop set adorning her neck. And don't miss those thick studded bangles! 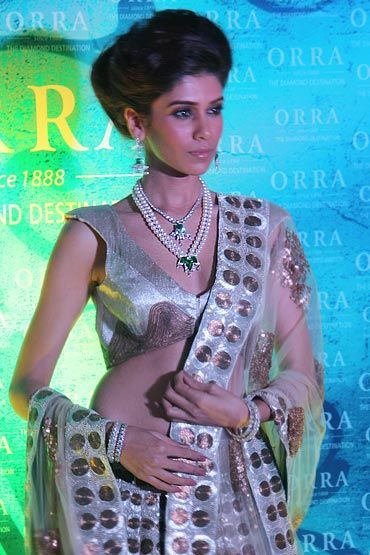 Up next are two rows of cascading pearls, set off once more by rich green gems and a silver-gold wispy drape. Another distinctly Indian neckpiece goes well with this beautiful sari, showing off slivers of silver against a rosy background. It's not always the heavy sparklers that draw attention -- make a simple but striking statement in tastefully selected jewellery against a neutral number like this beige lehenga and chocolate choli. 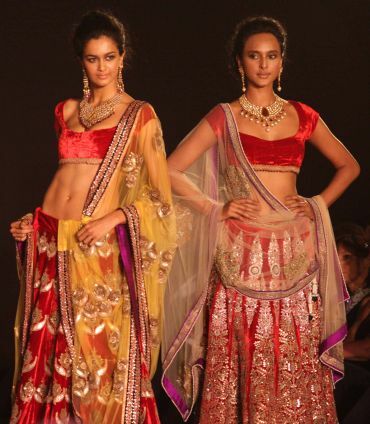 Two of Khanna's most gorgeous ensembles take to the runway in a haze of crimson, with ornate Indian jewellery that simply steals the show. All the lovely ladies line up at the finale, flanking Lavanya in the much-acclaimed bustier -- time to bring out the sunglasses, what with so much sparkle 'n' shine! Ethnicwear trends 2010: The best styles! Best LFW fashions on the ramp: Vote! Poll: Do you like these new sari styles?